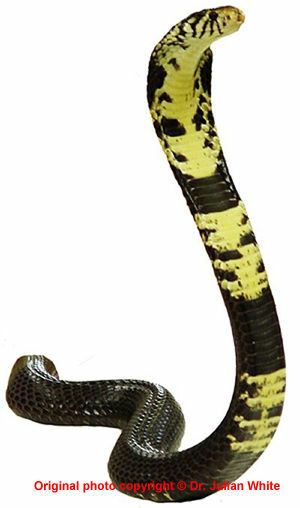 Largest African cobra, slightly depressed, tapered and moderately thick bodied snake with a medium length, slender tail. Body compressed dorsoventrally and sub-cylindrical posteriorly. Has long cervical ribs capable of expansion to form a long, wedge shaped hood when threatened. Can grow to a maximum of about 3.09 metres. Head broad, flattened and slightly distinct from neck. Canthus is distinct. Snout is rounded. Eyes are medium in size with round pupils. Dorsal scales are smooth, glossy and strongly oblique. Dorsal scale count ( 23 to 27 ) - 19 ( 17 to 21 ) - 13 ( 14 or 15 ). Tropical and subtropical rainforest and formerly forested regions, but restricted to more open savanna forest near the coast in southern Africa. Usually found in the vicinity of water in dryer regions. Persists in and around inhabited areas, particularly many central African towns and formerly forested regions. Terrestrial and mainly nocturnal, non-spitter and particularly fond of water. Often found in or around water. It will climb into low bush. A very alert snake, seldom cornered ( fast-moving ) and not particularly aggressive, but if confronted will raise its forebody and spread its hood and strike readily if provoked. Equally at home in trees, on the ground or swimming in lakes and rivers. Feeds on a wide variety of prey, including amphibians, lizards, bird eggs, rodents, small mammals and fish. Potentially severe bites, with paralysis. Admit all cases. Support impaired respiration. 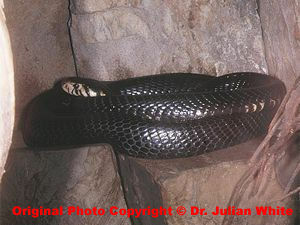 For cases with paralytic features or major local effects, IV antivenom is appropriate. Phone: ++966-1-252-0088 ext 45626, 45637.